Here are our January magazine reviews! Also this is the last day to enter our calendar giveaway! 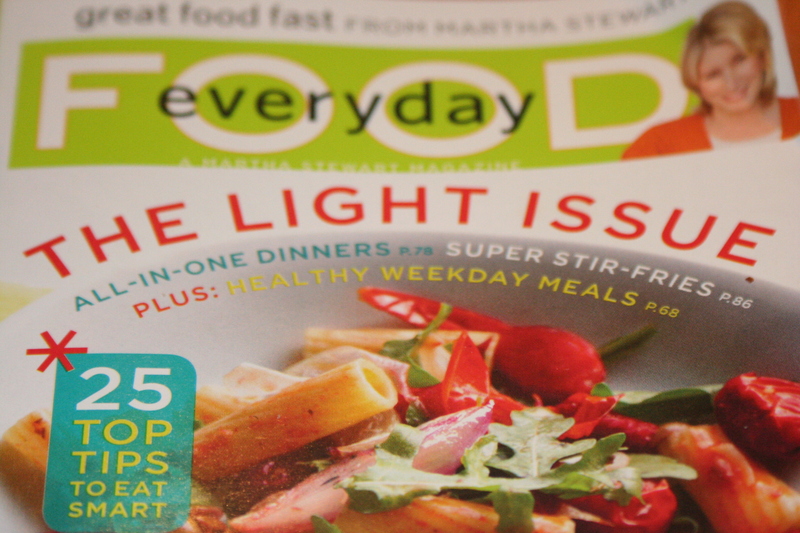 EVERYDAY FOOD (Alaina) - This issue is packed full of recipes. It includes several "light" recipes heading into the new year with health and diet resolutions. It also features a great section with citrus recipes. I especially think the Fresh Orange and Yogurt Tart looks wonderful. They also have a nice section on stir-fry! I decided to try the Chickpea Curry - it's vegetarian. My older kids thought it was a little too spicy but the youngest really liked it. It has an international flavor and is definitely curry. It was quick and easy to put together. You can serve this by itself or over couscous or rice. I like the addition of the lemon wedge - I squeezed it over right before eating and it added some freshness but was not over-powering. In a large skillet, heat oil over medium-high heat. Add onion and cook, stirring occasionally, until dark brown around edges about 6 minutes. Add garlic, curry, cinnamon, and pinch of cloves and cook, stirring, until fragrant, 30 seconds. 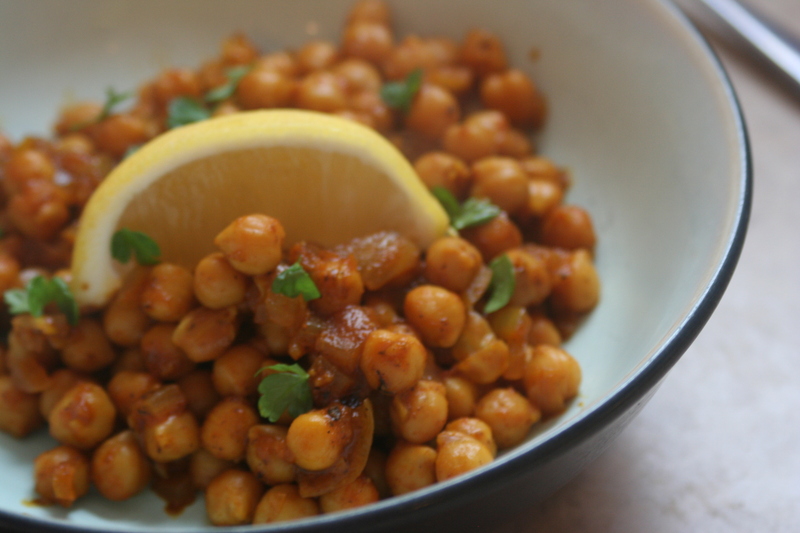 Add chickpeas, ketchup, 1 tsp. salt, 1/4 tsp. pepper, and 2 c. water. Bring to a boil; reduce to a simmer, cover, and cook 20 minutes. Uncover and increase heat to medium-high (I removed the cinnamon stick at this time); cook until sauce is lightly reduced, 5 minutes. Serve topped with cilantro, with lemon wedges along-side if desired. 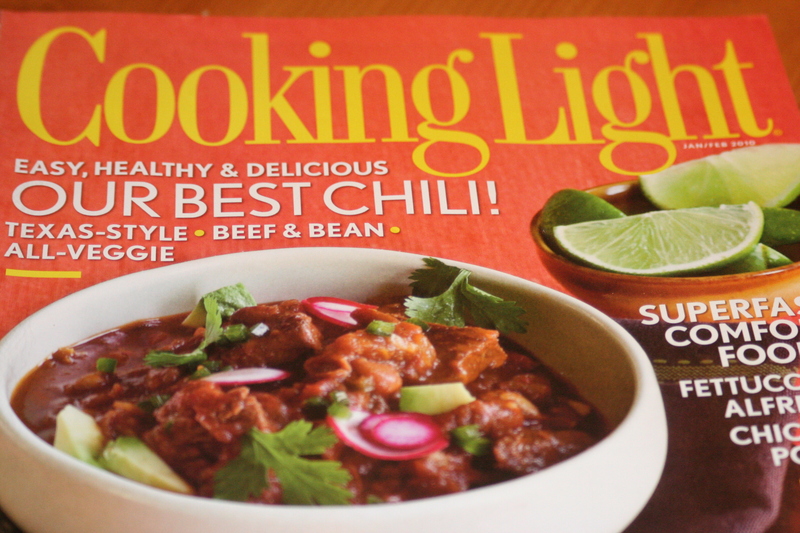 COOKING LIGHT (Alaina) - This issue features quite a number of seafood recipes but it also include a variety of other proteins and main dishes. There are several soups and several vegetarian recipes. 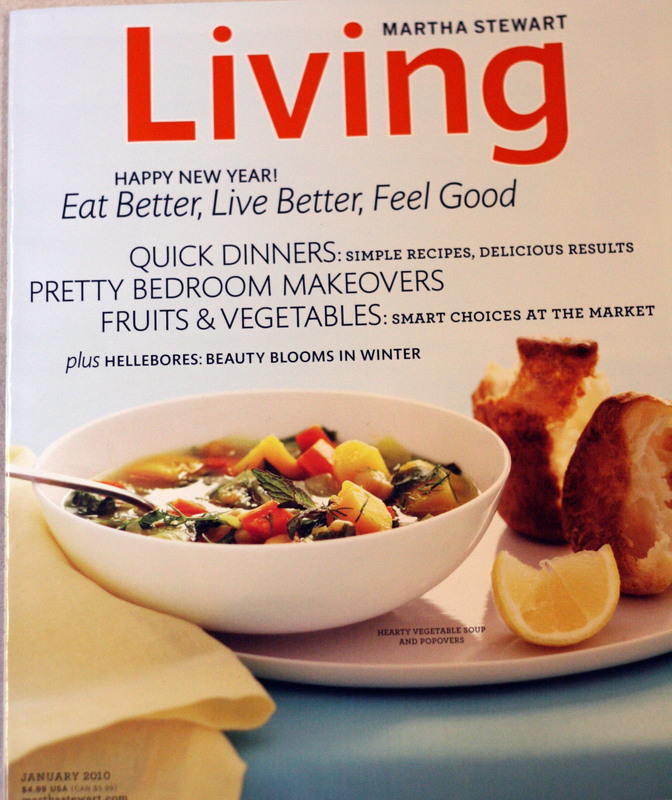 The cover boasts superfast comfort foods and tips for eating healthier in 2010. The photos are (as always!) beautiful and inspiring. The Upside-Down Fudge-Almond Tart looked delicious and I really would like to try the Grown-Up Grilled Cheese. I tried the Carrot Cake Pancakes and they did not disappoint. They were quite good topped with the suggested honey butter and even though it doesn't keep it quite as light, we added a bit of pure maple syrup drizzled on top. Yum! Combine flour and next 7 ingredients (through ginger) in a large bowl, stirring with a whisk. Combine brown sugar and next 4 ingredients (through eggs); add sugar mixture to flour mixture, stirring until just moist. Fold in carrots. Heat a large nonstick skillet over medium heat (I used my electric griddle). Coat pan with cooking spray. Spoon batter by 1/4 c. into mounds in skillet, spreading with a spatula. Cook for 2 min. or until tops are covered with bubbles and edges look cooked. Carefully turn pancakes over and cook 1 min. or until borroms are lightly browned. Repeat until all batter is gone. 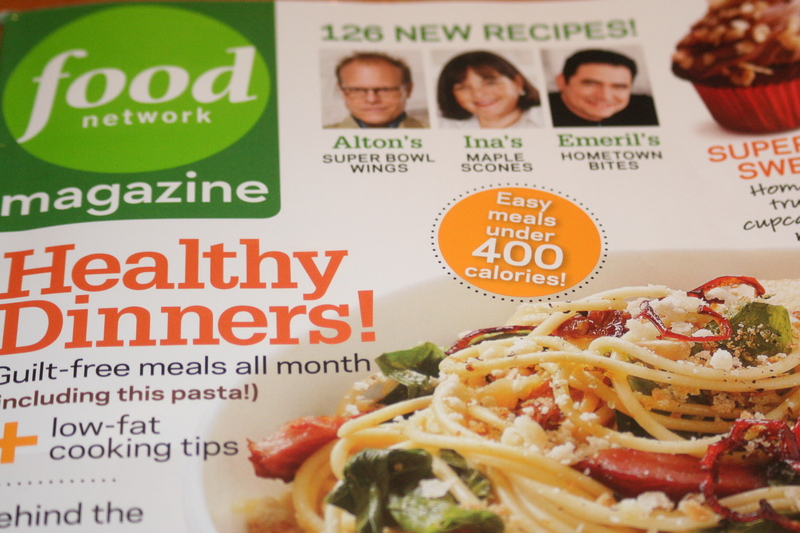 FOOD NETWORK (Alaina) - Perhaps the best feature of the January issue is the 50 dips pull-out. They have quite the variety of dips for your next party including several hummus recipes, aiolis, and southwest dips. I thought their cupcake recipes looked divine. The White Chili With Quick-Roasted Garlic sounded good and as did the Bourbon Praline Cake, the Truffles, and the Hot Wings with Blue Cheese-Yogurt Sauce. If you are hosting a super-bowl party or any kind or party this would be a great issue for you! I must mention that the section on Fast-Food Fix was quite disappointing to me. It seemed that it would be equivalent, healthy recipes - instead it used drive-through sandwiches and fillings to make different dishes. Not my cup of tea and far too many pages were devoted to it (four). Hopefully they will leave fast-food at the drive-through and come up with some creative alternatives in the future. 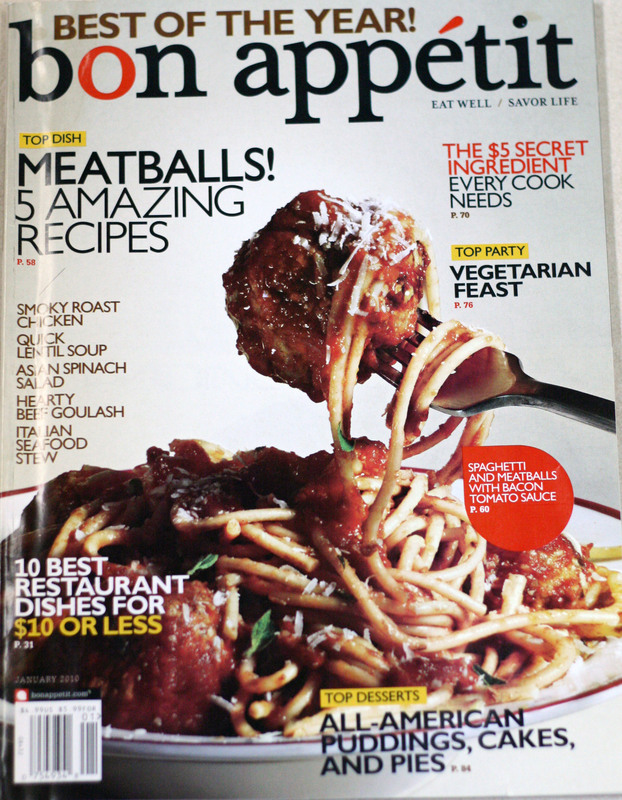 BON APPETIT (Heather) - This is Bon Appetit's "review of the year" issue. In it you will find the dish of the year, cuisine of the year, ingredient of the year, party of the year, desserts of the year, and getaway of the year. In the "fast, easy, fresh" section you will find a scrumptious looking Chocolate Nut Tart with Dried Fruit, Pork Tenderloin with Pears and Shallots, and Lentil Soup with Spicy Italian Sausage to name a few. Fennel is their ingredient of focus this month, with four recipes to try, including the Spicy Spaghetti with Fennel and Herbs which I tried and loved. The rest of the magazine is devoted to large and beautiful articles on each of the "of the year" topics, including numerous recipes, complete with gorgeous pictures. Saute pancetta in large skillet over medium heat until pancetta is golden. Using slotted spoon, transfer pancetta to paper towels. Add 1 Tbsp. oil to drippings in skillet. Add garlic and chiles; saute over medium heat 1 minute. Add fennel; cook until beginning to soften, 5 minutes. Mix in broth, 2 Tbsp. parsley, lemon juice, and fennel seeds. Bring to a boil. Reduce heat to low, cover, and cook until fennel is very tender, 20 minutes. Remove from heat. Season with salt and pepper. Cook pasta until tender; drain. Reserve 1 cup cooking liquid. Return pasta to pot. Uncover skillet with fennel mixture and return to high heat. Cook until almost all liquid is absorbed, about 4 minutes. 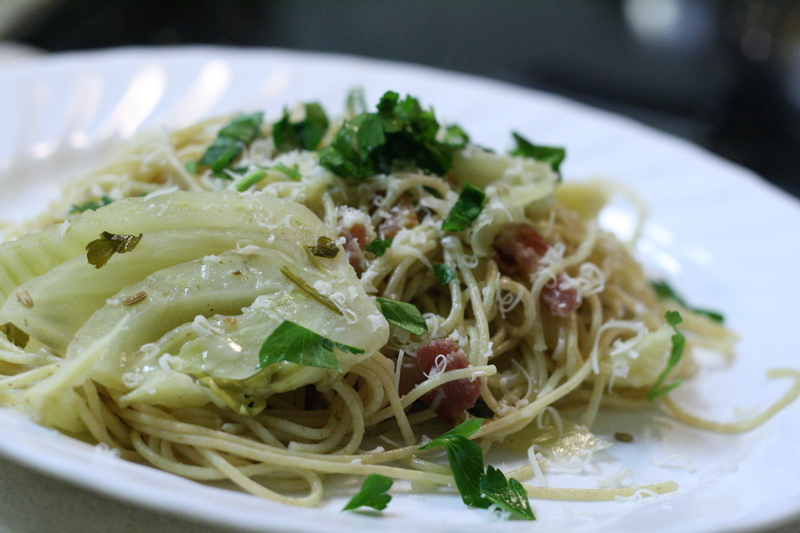 Add fennel to pasta. Stir in 2 Tbsp. oil, 1/2 c. cheese, and pancetta. Add cooking liquid by 1/4 cupfuls if dry. Toss pasta; transfer to serving bowl. Sprinkle 2 Tbsp. parsley over. Serve with cheese. NOTE: Since most of my family does not like very spicy, I omitted the jalapeno chiles and substituted most of the grated Pecorino Romano with 1 c. grated pepper jack cheese. I then just garnished the top of the spaghetti with freshly grated Parmesan. The dish was delicious! MARTHA STEWART LIVING (Heather) - I don't often consider reviewing MS Living for this blog because it is more than just a food magazine and often its recipes are a little "over the top." However, I was delighted to find a number of recipes in this issue which sounded very good and didn't look that complicated. The first set of recipes comes under the title Dinner in No Time Flat and is a collection of three main dishes based on paillards (pieces of meat that are pounded thin) cooked in a saute pan and finished with a sauce made in the very same pan. Included in the article are Chicken with Lemon Butter Sauce, Pork with Sour Cream-Paprika Sauce, and Veal with Mushroom, Mustard, and Sherry Sauce (for which I may substitute chicken). Cooking paillards in a saute pan is one of my favorite, easy dinners and I can't wait to try these new versions! Later on in the magazine there is a whole article devoted to chicken soup, with four options pictured just calling my name to be made. Recipes include Basic Chicken Soup, Thai Chicken Soup, Colombian Chicken Soup, and Spicy Indian Chicken Soup. Immediately following is a helpful article on Fresh Thinking: Organic, Local, Seasonal, meant to help you out when you go to the grocery store. The article includes The Clean 15 and The Dirty Dozen -- foods with the lowest pesticide residue and foods with the highest pesticide residue. Of course there are other recipes and articles, including a focus on cabbage, and a menu featuring a hearty winter-vegetable soup with popovers. Yum! MARY JANES FARM (Heather) - I also wanted to mention a magazine that has just come to my attention this week. Mary Janes Farm dubs itself "the everyday organic lifestyle magazine". Sort of a Country Living for those interested in organic, simple, and seasonal. 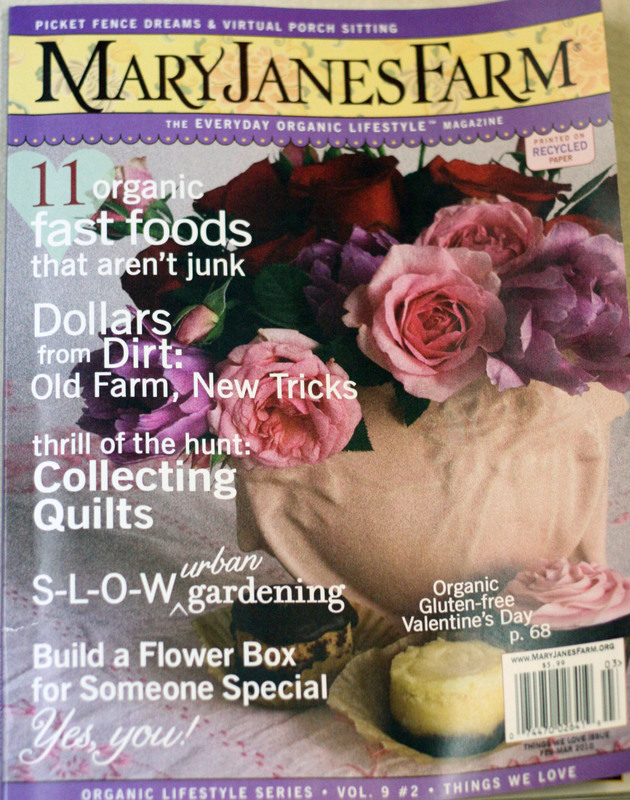 It includes a large section on food (this issue includes a great mini-section on an organic, gluten-free valentine's day), as well as sections on gardening, community, quilting & stitching/crafting, city and town "farming", and natural home care. Next time you are by a magazine stand, you'll have to have a look! This is my favorite feature. Thanks for taking the time to look through all the magazines! I really like this feature too, thanks for reviewing all of those! We splurged and tried the Pork Tenderloin with Pears and Shallots from Bon Appetit, and it was really good. 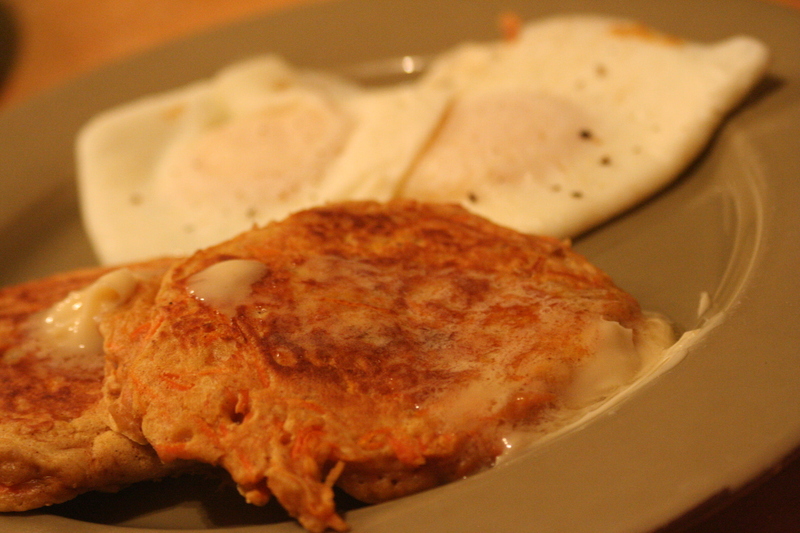 I made the carrot cake pancakes today and they were delicious. My husband didn't like them as much as banana or pumpkin (I think because they are less sugary), but I really enjoyed them. Thanks for sharing! Thanks again!! I'm sure this will become a regular weekly meal! hi-ya, I go over all your articles, keep them coming.